Wiptrac is (apparently) a work in process (WIP), integrated SPC quality, shop floor control, manufacturing execution system with capabilities targeted towards high tech manufacturing environments. That means absolutely nothing to me. However, it is clear that the client wanted to be able to showcase their software solutions without all the jargon that traditionally accompanies products of this nature in their market. 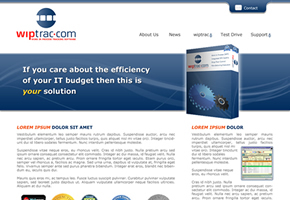 The wiptrac site design is very clean, web 2.0 layout, with a sliding jQuery contact form. It also allows for a showcase area on the home page to advertise their main featured product. 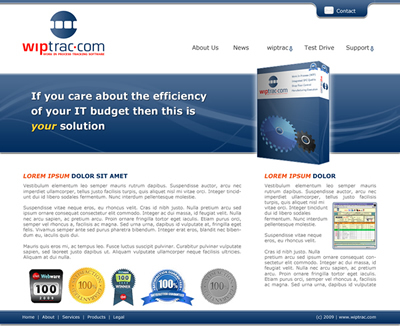 The box graphics were created for wiptrac as part of their design package.